NOTE: For over a decade, Amazon called their self-publishing paperback operation "CreateSpace". In 2018 they decided to stop using that legacy name and simply call their self-publishing section "Amazon". Throughout this section of my pages you may see the process referred to as either Amazon or CreateSpace. Both refer to the self-publishing paperback options provided by Amazon. CreateSpace, once known as BookSurge, is the free paperback self publishing option provided by Amazon.com. They have a very simple, free system that lets you create books, CDs, and DVDs. They even will assign a free ISBN to your book if you don't have one! I highly recommend CreateSpace as being your print on demand option for self publishing your paperback books. Begin by going to CreateSpace.com. You'll need to create an account. I recommend using a different password than your Amazon account, just for safety reasons. Note that you will need to give Amazon your home address and your Social Security number. This is normal, natural, and completely safe. It's required. Amazon is going to be paying you monthly income checks which are reported to the IRS. They need to report this information to the IRS just like any other work payment. This is all done securely. If you want to set this up as a business rather than a personal account, you can do that. It is up to you. 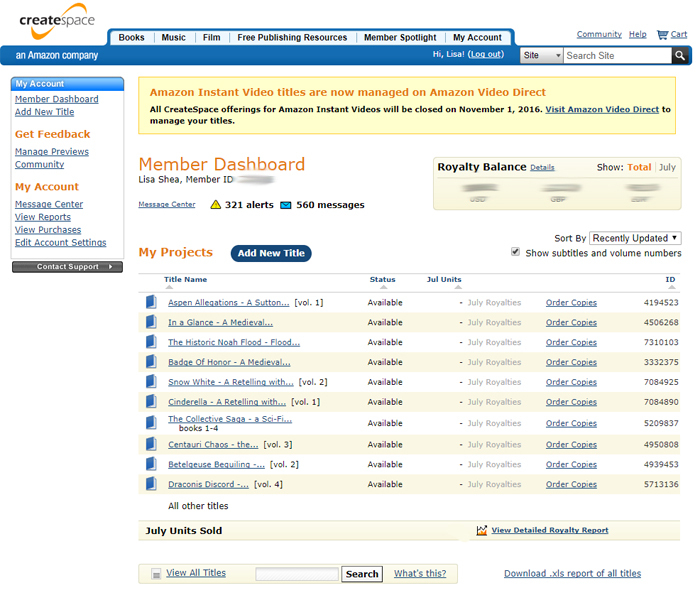 Your main screen in CreateSpace is your dashboard. This is where you see the list of books you have to work on. You can add new books, edit existing books, and order copies at your inexpensive "author price" direct from CreateSpace. This is how you would order copies of your own books to then bring to author signings and events. When you are ready to start adding your book, you will want to click on "Add New Title" in the top left. Note that you can always work on a book in stages. You can enter part of the information, save it, come back later, work on it some more, and so on. So there is no stress involved. Take it slowly if you wish. Nothing is ever live until you finally choose to make it live.